Does Dustin Penner turn the Los Angeles Kings into a Stanley Cup contender? Did Kings GM Dean Lombardi pay too high a price to pluck the goal scorer out of Edmonton? The answers are maybe and it all depends. Penner was the biggest name to move on a trade deadline day that was excruciatingly slow by recent comparisons, but Lombardi had to give up stud defense prospect Colten Teubert, a 2011 first-round pick and a conditional second-round pick in order to get a player who this season had 21 goals and 39 points on the Western Conference's worst team. The upside here is Penner can play left wing on the Kings' top line, alongside Anze Kopitar and Wayne Simmonds, moving Brad Richardson down to a bottom-six role. Penner, who scored 32 goals last season, could get hot in March during a playoff race and provide some momentum for an L.A. offense that is ranked 18th in the NHL (2.69 goals per game). The Kings have surged into fifth in the Western Conference and Penner only should make them stronger provided he quickly buys into coach Terry Murray's system. That shouldn't be a problem because he knows what playoff hockey is all about, having won the Cup with Anaheim in 2007 -- but he hasn't experienced it since. Penner also is not a rental, as he is signed through next season at a reported cap hit of $4.25 million. Now, what about the return Edmonton got for Penner? It's significant. Teubert was the No. 13 pick in the 2008 draft. He turned pro this season and has been a solid performer as a rookie for the Manchester Monarchs of the American Hockey League. He's not flashy; rather, he's a big, physical, stay-at-home, rock-solid blueliner who could be an anchor on the Oilers' blue line for the next decade. Edmonton already has a strong list of top young forwards, including Taylor Hall, Jordan Eberle, Magnus Paajarvi, Sam Gagner, Andrew Cogliano and Linus Omark. GM Steve Tambellini had to address defense in this phase of his rebuilding process and that's precisely what he did with Teubert. Getting another first-round pick, plus a second- or third-rounder in 2012 based on the language of the trade, is huge, too. Lombardi made the splash that hockey insiders felt he had to for Tambellini to give up a player who was expendable based on his age and the team's needs. Was the price too steep for Penner or did Lombardi get the scorer that will put the Kings over the top? We'll know sooner rather than later. Arnott the short-term answer -- Marcus Johansson might be Washington's long-term answer in its quest for a second-line center, but he doesn't appear ready for that role right now. Jason Arnott most definitely is, and the Capitals were able to get him for a fourth-line center in David Steckel and Washington's second-round draft pick in 2012. Steckel is a good faceoff man who hasn't provided much in the way of offense, but he is signed for two more seasons at a reasonable $1.1 million per season and should fit in with the Devils in a bottom-six, penalty-killing, defensive-zone faceoff role. The addition of the 2012 second-round pick probably convinced Devils GM Lou Lamoriello to make the move. Steckel is good in the dressing room and will be missed in Washington, but Arnott is a forward that can slide between Brooks Laich and Alexander Semin right now to feed into the Capitals' offense. He has won a Stanley Cup and should be energized about chasing another one with teammates like Alex Ovechkin and Nicklas Backstrom on his side. And on the defensive end -- Dennis Wideman comes with a hefty $3.9 million cap hit for one more season, but Washington got him for a 2011 third-round draft pick and a prospect for a couple of reasons. There is some uncertainty surrounding Mike Green's head injury and Tom Poti's groin injury, so Wideman can eat up the ice time, including power-play minutes, as the team waits for them to return. Even when Green and Poti are back, Wideman is a minute-munching, puck-moving blueliner who has played into the second round of the playoffs in each of the past two seasons. Caps GM George McPhee will have to deal with some salaries over the summer as he now has seven defensemen signed to one-way deals for 2011-12 and still has to get Karl Alzner under contract. However, the goal is to win now, so McPhee can worry about all that contract stuff later. Murray cleans house -- Bryan Murray has no public assurances that he'll be back in his current seat after the season, but the Senators' veteran GM did yeoman's work in getting a club that needs a makeover a decent return for a plethora of players this trading season. Murray capped his busy month Monday by shipping defenseman Chris Campoli and a conditional seventh-round pick in 2012 to Chicago for minor-league prospect Ryan Potulny and one of the Blackhawks' three second-round picks in 2011. Campoli is the seventh player from Ottawa's opening-night roster to be traded or waived. The housecleaning included the departures of Mike Fisher, Alexei Kovalev, Brian Elliott, Jarkko Ruutu, Chris Kelly, Pascal Leclaire and Campoli. Murray acquired in return five 2011 draft picks, including Nashville's first-round selection, two second-round picks, a sixth and a seventh. He also got a third in 2012 plus Potulny and goalie Craig Anderson, who can be an unrestricted free agent after the season. No one knows if Murray will have his job as GM next season, but he should pen a book on how to clean house because he managed to get something in return for everyone who he felt needed to go. Tallon predictably sells -- Florida GM Dale Tallon had no reason to stand pat, nor did he have a desire to look for a rental that might help the Panthers make a push down the stretch. He has a long-term plan for the Panthers that doesn't necessarily include winning this season. "This team hasn't done anything in 10 years," Tallon told NHL.com on Feb. 4. "It's not like we're a championship team." So every move Tallon made leading up to the deadline had the future in mind. His total haul includes 23-year-old forward Niclas Bergfors, minor-league prospects Jake Hauswirth and Evan Oberg, three third-round picks in 2011 and the expiring contracts of Tim Kennedy, Sergei Samsonov and Patrick Rissmiller. He had to give up Chris Higgins, Radek Dvorak, Dennis Wideman, Cory Stillman, Bryan McCabe, Bryan Allen and a fifth-round pick in 2011 that he acquired from Carolina in last week's trade for Stillman. Dvorak, Stillman, McCabe and Higgins are pending unrestricted free agents and not in Tallon's plans. Wideman is a tough loss now, but by moving him Tallon also moved his $3.9 million cap hit for next season. 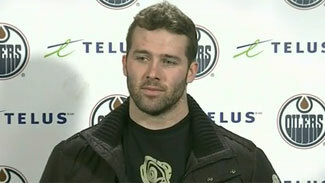 He has to be thinking 2010 top pick Erik Gudbranson will be ready for the big show next season. Allen is due to make $2.9 million next season. Tallon reportedly listened to offers for goalie Tomas Vokoun, but didn't like what he was hearing on the other end. Bergfors is littered with potential, and he scored 21 goals as a rookie last season. He was a key piece for the Thrashers in last year's Ilya Kovalchuk trade with New Jersey, but he never quite fit into coach Craig Ramsay's system or GM Rick Dudley's plans. He's a restricted free agent following the season, but it would seem likely that Tallon will re-sign him. The picks could be big for the Panthers this summer. They could use them or try to move them for a current NHL player. The jury is out on Hauswirth, who has been playing in the ECHL. Tallon basically sold off all the players that weren't in his future plans and tried to get whatever he could in return. Bergfors figures to be the most important piece he got back if he ever finds some consistency. Friendly dealing -- Phoenix needed a veteran defenseman with some offensive ability to replace the injured Ed Jovanovski, but to make it happen GM Don Maloney had to find a dollar-for-dollar trade partner. Columbus GM Scott Howson needed an upgrade to his offense, which is ranked 17th in the League (2.72 goals per game). The Coyotes and Blue Jackets were a perfect fit for a mid-afternoon trade that sent defenseman Rostislav Klesla and minor-league forward Dane Byers to Phoenix for forward Scottie Upshall and defenseman Sami Lepisto. Klesla is signed through 2013-14 at just under $3 million per season, while Upshall and Lepisto are free agents following the season, but their combined salary also is right around $3 million. Since Jovanovski is not due back until at least the playoffs after having surgery for an orbital bone fracture, Klesla would seem to immediately become a major part of Phoenix coach Dave Tippett's blue-line rotation. However, he hasn't played since Jan. 22 due to a bothersome knee. He's reportedly healthy and ready to go, but he might need a few games to get back into shape. Maloney doesn't make this deal if he doesn't have assurances that Klesla can be a factor. Byers, who has been in the AHL all season, may get an opportunity in Phoenix since Maloney knows him well from their time together in the Rangers' organization. Upshall will bring some added bursts of energy and offense to the Jackets as they continue their push toward a playoff berth. They remain four points out but stuck in 12th place despite an 8-2-1 record over their last 11 games. Lepisto will replace Klesla on the blue line and has some puck-moving and power-play skills. All in all a sound deal all around -- provided Klesla can stay healthy.